author of Perch, Mrs. Sackets, and Crow's Nest, and the person who created me. Mrs. Sackets: I'm sitting here on this lovely tree swing looking out over my flower garden and the beautiful countryside. Why did you choose your home town of West Carthage, New York, as the setting for this story? Karen: Andy needed a place where he could get bored, have time to slow down and think, spend time with his extended family, and appreciate the simple beauty that a small town like Carthage can offer. I also thought the story needed a place where his mom could come home to. Mrs. Sackets: You include a recipe for crow's nest in the book and mention that when you were young, your aunts and cousins would gather on your grandmother's porch and cut up those tiny hard apples from the ground. Did she have a rule like Andy's grandma that you could only pick the apples from the ground? Karen: Oh yes. Grandma P had several apple trees in her yard, with apples that came ripe at different times in summer and fall. My cousins and I all have a similar memory -- only the apples from the ground. We all remember the Crow's Nest, too, which the older cousins also called Apple Betty. Mrs. Sackets: I heard that just like Andy's mom, you are working on a music CD. Karen: Yes, the song lyrics in the book are from my CD. We've been working on it for about a year and we're almost finished. I'll let you know so we can listen together at Grandma's house. This dung clock hangs in Karen's kitchen. Mrs. Sackets: Do you really have a dung clock in your kitchen? Karen: Yes! My friend Donna, who by the way taught me to hula hoop in second grade, grew up on a dairy farm. 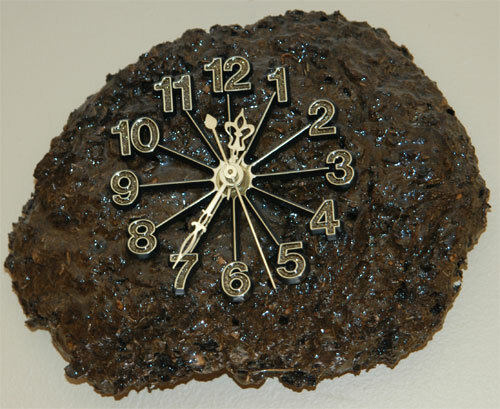 For my wedding, she made us a dung clock out of cow poop from her dad's fields. We'll be back in a little while. We're going to go hula hooping and have some lemonade. Check back later for more of our conversation!